Chrissie Chau Sau Na yesterday turned 33. She still spent her birthday at work, running in and out under 35 degree (Celsius) heat. 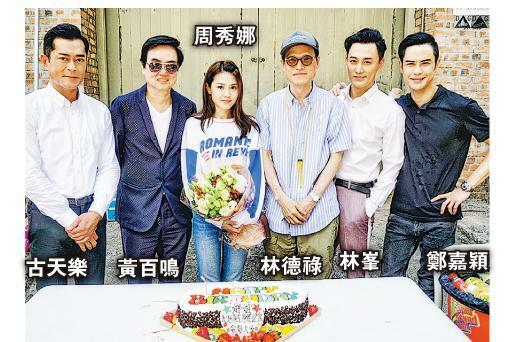 She joked that staring at hunks Louis Koo Tin Lok, Kevin Cheng Ka Wing, and Raymond Lam Fung could be reprieve from the heat. This group of hunks in the fiery weather celebrated her birthday with her, no wonder she was in a great mood! Birthday girl Chrissie yesterday morning went to work on a chase scene. In the 35 degrees heat she ran in and out outside. Chrissie said that she had the best way for heat relief, "Aside from the cooling spray, I check out the hunks during my break. Also people would keep 'treating' cold drinks." The hunks Chrissie referred to included Koo Tin Lok, Cheng Ka Wing and Lam Fung. They not only set up the cake for Chrissie, when Chrissie made her wish Goo Jai even put his hand over the candles to keep the wind from putting them out. Boss Raymond Wong Pak Ming was also on hand and presented flowers to Chrissie. Director David Lam Tak Luk led the birthday song singing. Everyone celebrated Chrissie's birthday outdoors without any fear for the heat. As for her birthday wish, Chrissie wished for good health, hit films. Speaking of age, she said that she was not "29+1". She joked, "Sorry! It's 19+1 haha, as for boyfriend it would depend on fate. I am a Buddhist, I can sit here and he would come." Now Chrissie would like to take time off the most, especially when the shoot yesterday took place in the sun and near the sea. Naturally she really wanted to get into the water and wanted to go somewhere with the sun and the beach.